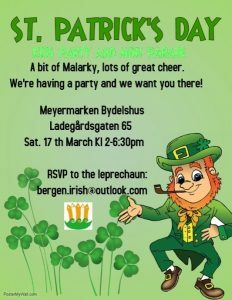 Bergen Irish together with Bergen Rugby Club minis will be celebrating St. Patricks Day at Meyermarken Bydelshus. There will be lots of fun and shenanigans! Get your shouting voices on as we will be watching Ireland V England in the rugby 6 nations. Please bring along some homebakes (sweet or savoury) with an Irish theme for St. Patricks Day. Don your finest county colours, wear green and kit yourselves out with the colours of Ireland. All Welcome…we appreciate a forewarning by email or in the comment box below as to how many kids are going so we know how much food to order!